I recently shared how our family started tithing, and even more recently, how God enabled us to begin giving a portion of what is left every month (a total miracle). In order to be responsible with our finances, I learned to look at our monthly financial picture and devise a budget. It is the only way to make sure we don’t unintentionally over-spend. Do you follow a budget? There are so many digital options that make it easy to keep track of expenditures. I finally gave up my paper and pencil and put our budget into the spread-sheet in Google Drive. I shared it with my husband’s account so he can see what we have to work with at all times. Making sure your spouse is on the same page is key–if they don’t know what they have to spend, one trip to town can completely sink your planning. My budget is open on my home computer, and I have access to it on my phone so I can update the categories with new receipts right away. This is working well for me, and the best part is, it doesn’t cost anything!! Start with prayer. Ask God to guide you and give you wisdom for the planning you need to do. Add up your fixed income. That is the amount of income you know for certain that you can count on every month. If you make extra some months, great! But don’t budget what isn’t for sure. Now take 10% off the top. Dedicate it to the Lord and write that check right away. What’s left is what you have to spend on you. Life and automobile insurance–Look at your bi-annual or annual bill and divide it by the number of months it covers to find out how much it costs per month. Then put that amount into savings each month so that when the big bill comes, you are prepared. Add up your annual car registration renewals, divide to find your monthly expense, and put it in savings. What other fixed expenses do you have? Monthly dues, entertainment like Dish, retirement investments, school loans, credit card payments, car payments, etc… add them in. Have you started an emergency fund? Don’t forget gas for your vehicles, and oil changes when they’re due. I budget a reasonable amount for this. Every month is a little different. If I use it all, great. If not, I put it aside to pay for more costly months, or set the extra aside for next year’s camping trip. When you have completed your fixed expenses and deducted them from your total, now you get to work with what is left over. Make yourself a category for groceries. Looking through last months receipts may be helpful, or this next month may be eye opening for you as track what you spend, keeping track of what you have available in your budget. Use this information to set aside a reasonable amount to spend on food in future months. You also need to set aside funds for your non-food items. You can break this down into lots of small categories, and a budget sheet usually has some of these suggestions already available to use. Or, if there’s not a lot to work with, you might opt to have one simple category like I use–“Everything Not Food”. This includes our diapers, postage, clothes, homeschooling supplies, toiletries, gifts… literally, any monthly expense that isn’t food. Now look at your total income and subtract everything you budgeted for expenses. Does your budget balance? If not, start praying about how to make adjustments, or if necessary, how to bring in additional income. We actually have our deep freeze on a timer. It is off at night when we are sleeping and no one will open it. Everything stays frozen. Then the timer turns it back on during the day. So we run a deep freeze, which is a necessity with such a big family, but we only pay for electricity half the month!!! Don’t do unnecessary driving so you can save money on gas. I try to do all my town stuff only one or two days a week. Find ways to cut back on groceries. This may include using coupons, comparing costs at different stores, menu planning so that you don’t buy anything you don’t actually need, eliminating desserts, or saving $ on some recipes by cooking from scratch. Eating out less or not at all. We had to stop eating out years ago, and our diets have become so healthy that when we do occasionally get to eat a meal out, it doesn’t settle well on the tummies. Home food is definitely healthier and more affordable. Let me encourage you, if you don’t already tithe, consider giving back to God. I promise, if you are trusting Him with what you have and believing that He is going to take care of you, you will not be disappointed. I had to pause for a second, realizing I had just given God a door to build my son’s faith, and hoping that He would use it. You know, He didn’t disappoint. Less than 24 hours later, a friend of camp, who we see maybe once a year, showed up in my husband’s office. “Do you like venison?” he asked with a smile, holding out a bag containing 15 pounds of processed venison steaks, chops, and roasts. God is always showing up, even to rescue the budget of His precious son or daughter who is befuddled on how to stretch their resources while purposing to give back to Him. I could tell you story after story. Miracles become common place. It really is easier to live on less when God receives His portion first. 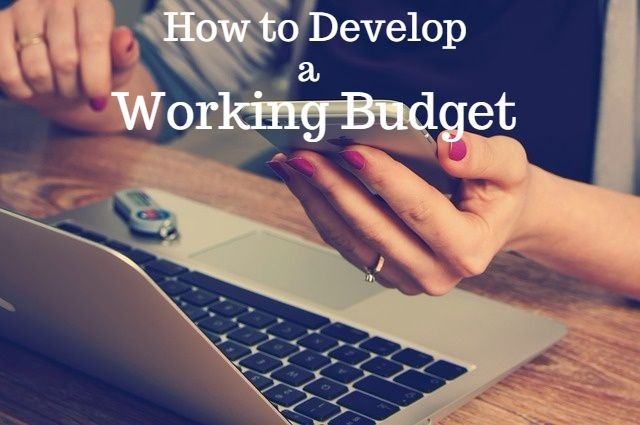 I hope this blesses you as you plan and put together a working budget. Love this, Linda. I could not function without a budget and I follow it 🙂 Tithing is always at the top of the budget and everything else follows. We usually shop for groceries in bulk, this saves us money and time. We also cut out our cable; Netflix and Amazon do the job. We have included limited eating out. I agree, Netflix and Amazon are more than enough around here. I buy several of our hard to find pantry items through Amazon every month, so I finally got their rewards card. We pay it off every month, and the cash back on our purchases will cover our Amazon Prime membership, so that is a blessing too! This is so good! I can’t live now without a budget – the security of knowing where our money is going is too relieving! And OH MY GOSH!!!! I didn’t know y’all had 8 kids :O !!!!! That is so beautiful and wonderful!!! So you would REALLY know or have an idea what you’d want your daughters to know about becoming wives, mothers, and good members of society. I just started writing these because having a daughter is literally the scariest thing I’ve ever done! All I’ve known are boys for 7 years!!! And my husband has been so good with teaching them masculinity, but I’m finding there’s just so much I’m going to have to teach her that he isn’t really aware of if that makes sense. Do you think you could write a post that I could feature on my blog for what you want your daughters know (any topic you wish)? I’m sure you’ve already taught the older ones everything they need to know 😀 but if you could pinpoint the most important things you’re glad you taught them or are teaching them, that would be SO VALUABLE to me and I’m sure many other people! I’m making a little book where I’m printing off these posts so that our daughter (and any others later on) can read them when they’re older. Stephanie, your request is a real honor. My oldest daughter is 19, and the youngest is 2, so we’ll be teaching for a long time yet. 🙂 To be honest, the closer our oldest girls get to that day I know they’ll leave our nest, the less prepared I feel. There will always be lessons! The years are SO short. I will pray over this and see what topic God might bring to heart. Thank you so much. Thank you so much Linda, I know it will be full of wisdom and I love listening to other women who have been through it and who I can look up to as role models, even online! If you want you could email it to my email address (angelpixiedust86@live.com). Or if you post it on your blog, I can simply do a “re-blog” of it!